The patient was overweight and had Type 2 diabetes. He was on Crestor for cholesterol, Atacand for hypertension, the proton pump inhibitor Protonix for GERD (gastro-esophageal reflux disease), Axert for migraines and Singulair for asthma. The patient was 8 years old. Since pharma discovered the ka-ching in pediatric psychopharmacology, millions of kids are on ADHD meds and other mental drugs for conduct disorders, depression, bipolar disorder, oppositional defiant disorder, mood disorders, obsessive-compulsive disorders, mixed manias, social phobia, anxiety and assorted “spectrum” disorders. They are even treated for seizure spectrum disorders with no seizures. Since 2001, high blood pressure meds for kids have risen 17 percent, respiratory meds 42 percent, diabetes meds 150 percent and heartburn/GERD meds 147 percent. Fifty percent of pediatricians also prescribe kids insomnia drugs, according to an article in the journal Pediatrics. In fact, 25 percent of children and 30 percent of adolescents now take at least one prescription for a chronic condition says Medco, the nation’s largest pharmacy benefit manager, making the kid prescription market four times as strong as the adult in 2009. Why? Well one reason is the ped population is suffering from “middle age spread,” just like the adult population, from too many calories and too little exercise. Over a third of US kids are overweight and 17 percent are obese—which for a 4-foot-10 inch child would be 143 pounds—which predisposes someone to diabetes, hypertension, high cholesterol, sleep apnea, gallbladder disease and the osteoarthritis and musculoskeletal disorders kids are also contracting from carrying around too much weight. But another reason is the direct-to-consumer drug advertising on TV which began over a decade ago. In between ads for M&Ms, Reese’s Peanut Butter Cups, Oreos, Hershey’s Milk Chocolate and Doritos, kids and their parents saw $108 million worth of ads for Prilosec, $100 million for Claritin and $91 million for Zocor in 2000—when the national “epidemics” of GERD, “seasonal allergies” and “statin deficiencies” began. Nor are the meds kids are taking even deemed safe for children. Kids react differently to medicines, says Duke University pediatrics professor Danny Benjamin in the Wall Street Journal, and in a third of FDA studies, what was thought to be the right dose for a kid, wasn’t. Long-term safety in kids is also “almost never known,” says Dr. Benjamin, since ped studies, like all drugs studies, are of short duration. 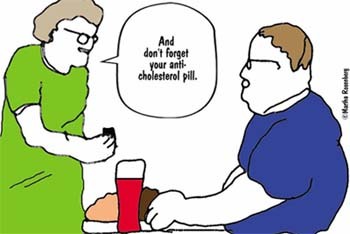 Over-prescribed, of debatable effectiveness in reducing heart attack, less desirable than lifestyle changes to lower cholesterol and expensive, statins are six times more likely to cause liver dysfunction, acute kidney failure, cataracts and muscle damage in adult patients, says a 2010 article in the British Medical Journal. Let’s give them to kids? Statins are also linked to nerve damage, memory loss, sleep disturbances, impotence, breasts in men, a lupus-like syndrome and acute, usually mild, pancreatitis in an observational, study says the Medical Letter, though cause and effect are not clear. The asthma drugs, long-acting beta-agonists or LABAs, billed as add-on drugs to “control asthma,” turn out to sometimes worsen asthma and cause asthma-related intubation and death—exactly what they were supposed to prevent! And who is at the highest risk for harm and death from the drugs? Children 4–11 years old, according to the FDA. And Singulair, another allergy/asthma drug marketed for kids with simple allergies like hayfever that could be treated with over-the-counter antihistamines? In addition to FDA warnings about psychiatric side effects and published suicides of children on the drug, Singulair is believed linked to the aggression, hostility, irritability and other behavioral symptoms that are diagnosed as ADHD, says Fox News. Will pediatric Singulair patients join the 4.5 million on ADHD medicines and suffer those side effects too? Still pharma’s most insidious war on children is probably trying to get babies on GERD medicine. Even though the approximately 71 times a day that babies spit-up is considered perfectly normal and does not damage the esophagus, the number of GERD prescriptions for babies has recently quadrupled, writes pediatrician Darshak Sanghavi. The drugs don’t treat baby reflux but they “may increase brain bleeds and gut damage in preterm infants as well as the risk of food allergies in older infants,” says Dr. Sanghavi, author of the bestselling A Map of the Child. Oops. Since the pricey “Purple Pill” heartburn drug Prilosec debuted over a decade ago, followed by Nexium, proton pump inhibitor drugs (PPIs) that switch off stomach acid producing cells have become veritable “purple crack” say US doctors. And just because PPIs are prescribed for people who don’t need them or can’t benefit from them, doesn’t mean they’re not also unsafe. And in kids? Common adverse effects of PPIs in children include headache, abdominal pain, nausea, constipation, diarrhea and increased risk of community-acquired pneumonia say medical sources. So why is pharma picking on the child patient? The same could be said of drugs for other kids’ diseases—the “adult” ones and the psychiatric ones.